The Pro-Change Program for Healthy Eating comprehensively and broadly addresses healthy eating for adults at a healthy weight to promote the adoption of a pattern of eating that allows individuals to maintain their weight; encourages the consumption of a variety of food high in nutrients; and encourages the limitation of saturated fat, trans fat, sodium, added sugars, and refined grains. Only 30% of Americans are at a healthy weight. This program aims to prevent overweight and obesity among this healthy minority. 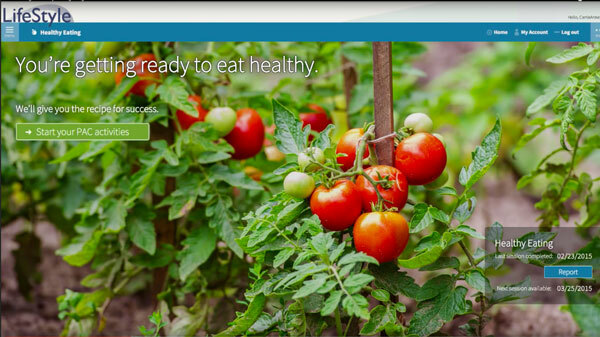 Online computer tailored intervention that assesses and provides individualized feedback on fruit and vegetable intake, which is a marker behavior for healthy eating. Consistent with national dietary recommendations, the program provides tailored feedback on other important elements of nutrition, including servings of whole grains, low-fat dairy products, and lean proteins. Dynamic web activities matched to the individual’s readiness to change (e.g., a healthy eating quiz; games to teach portion control, how to read a food label, and how to make healthier fast-food choices; a flip book of colorful fruits and vegetables choices along with simple recipes; suggestions for healthy snacks, healthy restaurant choices, and making healthy choices on a budget). Request a Healthy Eating Demo! Our Weight Management clinical trial showed that significantly more healthy eating program participants had reached the Action or Maintenance stages than the comparison group. See our Weight Management program page for study details.